In this work, we determine the critical exponent for a weakly coupled system of semilinear wave equations with distinct scale-invariant lower-order terms, when these terms make both equations in some sense “parabolic-like.” For the blow-up result, the test functions method is applied, while for the global existence (in time) results, we use \(L^2\)–\(L^2\) estimates with additional \(L^1\) regularity. The Ph.D. study of the first author is supported by Sächsiches Landesgraduiertenstipendium. The second author is member of the Gruppo Nazionale per L’Analisi Matematica, la Probabilità e le loro Applicazioni (GNAMPA) of the Instituto Nazionale di Alta Matematica (INdAM). The second author is supported by the University of Pisa, Project PRA 2018 49. 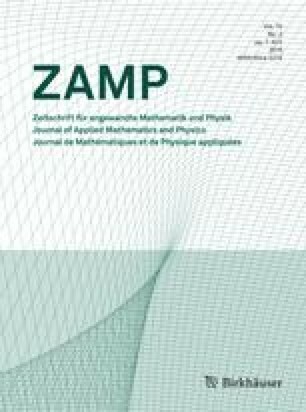 This work was partially written while the second author was a Ph.D. student at TU Freiberg. Finally, the authors thank their supervisor Michael Reissig for the suggestions in the preparation of the final version and the anonymous referees for carefully reading the paper.